The first step in making an allumette cut (​prounced al-yoo-MET) is to cut your product (in this case I'm using jicama) into ½-inch slices and 2½ to 3 inches long. Square off the edges, and then you're going to cut them in half lengthwise, giving you several flat pieces, ½ inch wide and ¼ inch thick. Since they're flat, you can stack a few of them up -- maybe 3 or 4 at a time. Can you guess what's next? Yep, that's right: We're going to slice the whole stack right down the middle. 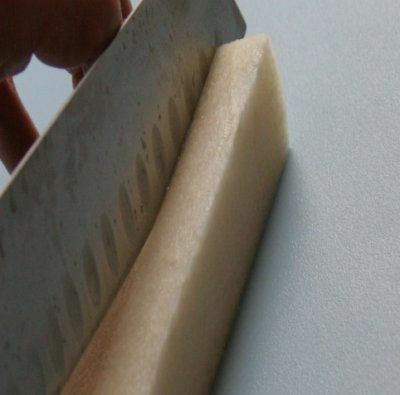 Use the tip of your chef's knife for precision work like this. Continue lowering the tip of the blade through the entire length and thickness of the stack. Be careful -- this part is where your knife is most likely to slip. The allumette knife cut measures ¼ inch × ¼ inch × 2½-3 inches. Isn't it glorious? The allumette is also the starting point for another culinary knife cut, the small dice.